After the death of Julian, we look at the brief reign of Jovian as well as important expressions of Christian culture at this time. The poetry of Faltonia Betitia Proba shows how Christians were able to use the styles of pagan authors such as Virgil to express Christian teaching. 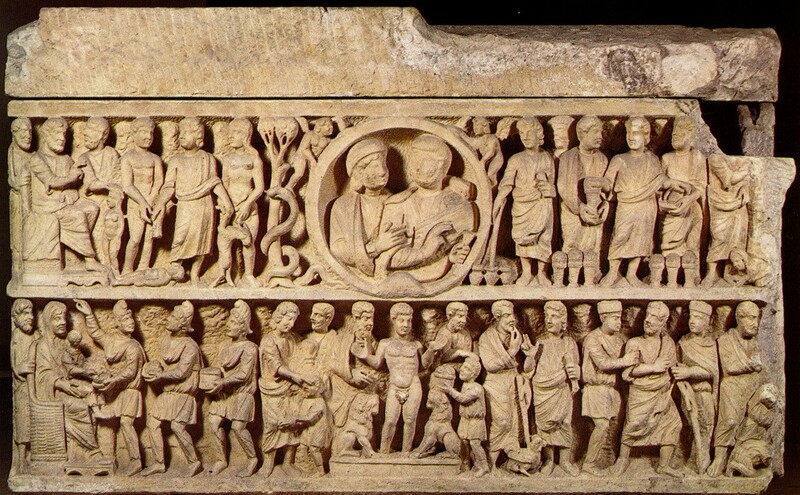 The Dogmatic Sarcophagus and the Sarcophagus of Junius Bassus show developments in the Christian representation of Jesus Christ and the Trinity. Selections from the poetry of Faltonia Betitia Proba – begins on page 170. Sigrid Schottenius, “Typology and the Cento of Proba”, Quarderni Urbinati di Cultura Classica, Vol. 95, No. 2, (2010), pp. 43-51. This entry was written by sbeshonertor, posted on October 21, 2016 at 8:00 pm, filed under Podcast and tagged Apollinaris, Christian Art, Jovian, Proba. Bookmark the permalink. Follow any comments here with the RSS feed for this post. Post a comment or leave a trackback: Trackback URL.